Working with Elevated Gardens was my first and most compelling foray into encouraging urban dwellers and anyone else interested in low maintenance, high yield self supply where available growing space is limited. 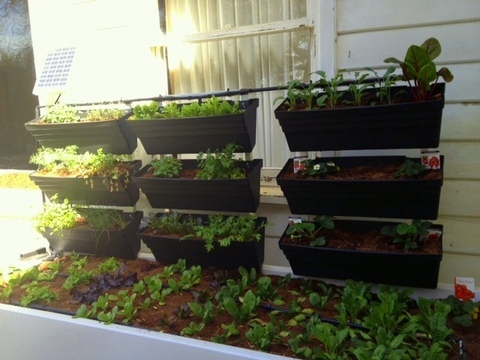 Self contained units of various size, in which water and nutrients are circulated under solar power are set up where a reasonable amount of sunshine can trigger the photosynthesis required for healthy plant growth. Furthermore, being elevated and multi layered, gardening should be easy on the back. I loved the theory. The brains behind Elevated Gardens are Andrew Olley (inventor), and Tracey Perez (Manager of Sales and Marketing), who were recommended to me by the Elders experts at Bairnsdale, visited me in Bowral. We shared the same enthusiasm for having more Australians experience the rich rewards that come from successful self supply. Successful being the operative word . What’s the point of spending time and money setting up a system, only to be frustrated along the way and ultimately crestfallen when at the end of it all, there’s no salad! Andrew and Tracey were confident, so we set up a Sustain 3D model right at my front door, facing north. I would like to point out two things. Firstly, no money changed hands and secondly, I don’t personally require extra growing space. This was an open experiment so everyone visiting my site could watch the journey from set up to success or failure and make up their own mind. Here are the images from when Andrew and I put my unit together. Andrew Olley contemplated what was the best spot to set up my garden: an open airy site, relatively wind free and with access to at least a few hours sunlight each day, both for plants and the solar panel. First we set up the base lining, wrapped in porous cloth to allow excess water to pass through the growing medium. The upright was first assembled, then attached and the baskets simply clipped on. There were a series of screw in pieces: water gauge, overflow valve and reservoir lid. Next the cocopeat – I found the texture to be quite unique; an organic by-product from coconuts, it seemed to be both friable and sturdy. Finally the pipe system and filters, followed by the solar panel and pump, then a pre wetting with the hose before filling the reservoir to the recommended 300 litres. This was all achieved in under one hour. Time to plant. According to Andrew, it is best to transplant seedlings directly into the cocopeat even though seeds can be scattered directly on to the cocopeat. I will nevertheless try seeds later and let you know. When planting seedlings, it’s important to wash off as much of the potting soil mix so we don’t fill the reservoir with soil. Simply immerse roots into a bucket of water and shake about. Then pull away some cocopeat and pop the roots straight in and tamp around the base to secure the plant, much like planting into the soil. 10th September 2013 – Two weeks down the track. I’m pretty amazed that without nutrients, my plants were able to stay so Perky. Really impressed in fact. By the way, Andrew explained it’s a good idea to let the plants embed and settle for two weeks without nutrients. I expected saggy seedlings. However, not the case. The cocopeat is truly an excellent product. It’s texture is perfect for plant roots to take a secure hold and have immediate access to water. Surprisingly, not one seedling wilted – even in full sunlight. The solar pump kicks in only once in 24hours and delivers enough water to saturate the cocopeat, with the excess flowing back through into the reservoir, which means just the right amount of water is retained to keep the plants happy until the next watering. I wonder how adding nutrients will affect things. Unbelievable! The liquid fertilisers were added as instructed and the plants just loved it. Have a look and listen to the video shot 2 weeks after planting. Notice the plant vigour (also, my excitement with the bug management). 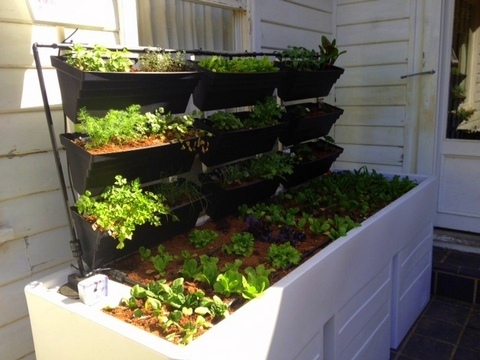 There is an Elevated Gardens product to suit everyone who wants an easy to use, sustainable growing solution for vegetables, herbs and flowers. Elevated Gardens thrive even in densely populated, urban spaces, as long there is sun. They are ideal for apartments, rooftops, backyards, schools, restaurants, resorts, office buildings, aged care homes, correction facilities and community gardens.